It was only a few days ago HERE, when Pucky showed us all a little taste of her blind box series “Pucky Pool Babies” which is powered by the folks at POP MART. Today Pucky has shown more from the adorable series. See, not all Mondays are bad Pucky is here to bring you smiles. 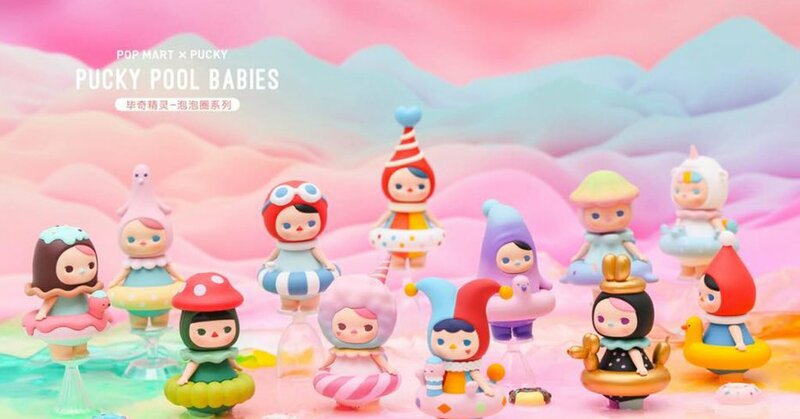 Like we said a few days ago, December 2017, news broke and fans of 畢奇 Pucky had teased an upcoming art collectable toy HERE named “Pool Babies”. Fast forward to 2018 present day and our predictions came true! Pool Babies already looks promising with the innocent eyes and colourful Pucky colour palette. 2018 should be another smash hit for Pucky, in art collectables as well as her fantastic art and now with the much anticipated blind box mini series with a range of Pucky characters. Today Pucky also shares some new coloured variants and also what looks like the golden CHASE figure.